How it would be if the regular book is electroniced? 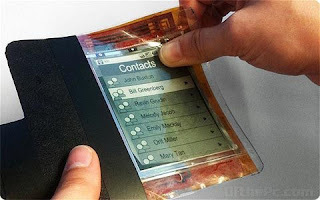 Is the idea behind this new flexible iPhone the smartphone prototype, called PaperPhone does everything a smartphone does, like store books, play music or make phone calls. This Electronic book consists of a 9.5 cm diagonal thin film flexible E Ink display. The flexible form of the display makes it much more portable that any current mobile computer: it will shape with your pocket. "This computer looks, feels and operates like a small sheet of interactive paper. You interact with it by bending it into a cell phone, flipping the corner to turn pages, or writing on it with a pen." This is the future. Everything is going to look and feel like this within five years,"
The invention, heralds a new generation of computers that are super lightweight, thin-film and flexible. They use no power when nobody is interacting with them. When users are reading, they don't feel like they're holding a sheet of glass or metal. The epaper sheet, which uses the same e-Ink technology found in the Amazon Kindle ereader, is just millimetres thick and can be used to make phone calls, read ebooks and play music.